Since the time of the Magna Carta, the rule of law – the ability of the nation to limit the power of kings – has been the crown jewel in the system that underlies our Western (liberal) democracies. Survival of this rule of law has hung in the balance many times, but never more so than during the youth of the generation that fought World War II. Three times in that war, the survival of democracy was in mortal danger – and was saved by the inspired defense provided by western intelligence services. 1…During the battle for air supremacy over Southern England, a small but vital lead in the emerging technology of radar was kept secret by British intelligence. Britain’s coastal radar allowed its fighter forces to deploy with maximum efficiency against the swarms of German aircraft that swept over the Channel to destroy the island nation. If this defense had been compromised, the Luftwaffe would have overwhelmed Britain’s air defense, allowing German troops to invade England and destroy the last bastion of democracy in Europe. Later, the US would have faced a grim reckoning with Hitler – alone and at a time of Hitler’s choosing. 2…British and Polish intelligence services cracked the German Enigma code, while America’s intelligence services cracked the main Japanese naval code. Without these brilliant feats, the forces of fascism might well have plunged the world into a new dark age. 3…The veil of secrecy that shrouded the Manhattan project, accompanied by the penetration of the equivalent German project by Allied intelligence forces, guaranteed that the race to atomic weapons would be won by the West, securing the ultimate survival of democracy. Had any of these victories by Western intelligence services gone the other way, a nightmare age of fascism might have resulted. 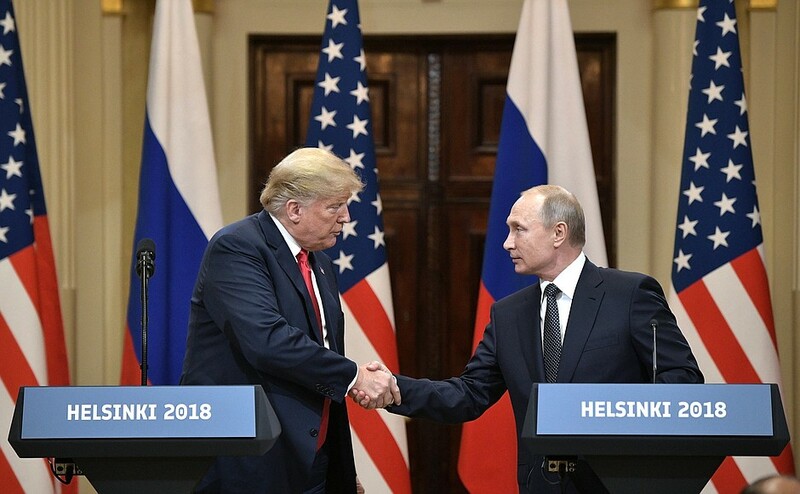 It is against this historical backdrop that we must view Donald Trump’s disrespect for our intelligence services at the Helsinki summit press conference. What we saw – in disbelief – was an American President standing shoulder-to-shoulder with a lawless dictator, whose goal is the destruction of Western democracy and the system of alliances that has preserved it for the last seven decades from the threat of Communist tyranny and its successor, the Putin gangster-state. We cannot stand aside when a president, at a perfect moment, fails to defend the electoral integrity of our democracy. Trying to walk it back, after the fact, based on popular reaction, is not enough. Conservatives, in particular, should put aside their agenda to deal with this emergency. This is not the time to debate tax policy, immigration law, or the overturning Roe vs Wade. To do so is to fiddle while Rome burns. The President of the United States – for whatever reason – in Helsinki, before the world, turned his back on his oath of office to defend our country and its free institutions. In that telling moment, he openly, brazenly cast his lot with the leader of a hostile foreign power – in opposition to the very men and women whose dangerous and demanding service in intelligence is all that stands between us and the destruction of democracy. We must not, for the sake of secondary political goals, betray our first duty, which is the same as the President’s: to protect and defend the Constitution of the United States. That Constitution appears to be under imminent threat. We must assume that Donald Trump has joined a hostile foreign power in an assault on our free institutions. This threat must be met now, above all else, while we still control the electoral process that guarantees every American citizen a voice in government.